Apple today released iOS8 for the iPhone, iPad, and iPod Touch (5th gen). 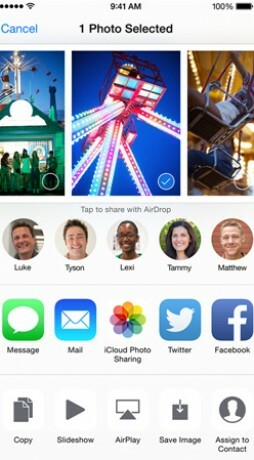 iOS8 offers a number of refinements to Apple's mobile operating system. Some of the new features include a new word prediction engine and support for third-party keyboards; family sharing for iTunes content; Continuity for seamless messaging across devices; revised gallery and camera apps that make sharing and editing easier; improvements to Spotlight search; the ability to send audio clips within text messages; and Health for tracking fitness and health apps. iOS8 is compatible with the iPhone 4s, 5, 5s, and 5c, as well as most iPads. It comes preinstalled on the iPhone 6 and 6 Plus, which go on sale September 19. The system update can be installed over Wi-Fi or via iTunes. Twitter updated its iOS application today and the chief new feature is landscape support for the iPhone 6 Plus. Owners of Apple's larger iPhone will now be able to use the app when holding their phone in either portrait or landscape orientation. Twitter today released a new application for the iPhone called Periscope. The app lets people broadcast live video to their Twitter followers. Google today released a version of its calendar application for iOS devices. The app includes features such as Assists to help schedule regularly-occurring meetings, as well as Schedule View to make it easier to glean daily schedule details in a glance. For sure iOS8 is available for the iPad2. I really didn't think it would still be getting the love from Apple. It is often possible to put newer versions of iOS on older equipment, however this often has the result of making the older equipment basically unusable, like what infamously happened to the iPhone 3G is someone attempted to install iOS 4.0 on it.